Take a voyage back in time to the ancient Western Japan. Take a trip in a time machine and stroll along to enjoy the picturesque rural beauty of Kyushu.Get to learn more about the picturesque Japan featuring Shimabara Castle, Kuma Shochu Museum and Daizaifu Tenmangu. Assemble at Home Country Airport for your flight to Fukuoka, a vibrant yet compact city in Western Japan and the gateway to Kyushu for many travellers. Upon arrival, proceed to Daizaifu Tenmangu, a famous shrine enveloped with 6,000 plum trees. Your next stop will be Ureshino Ocha Cha Mura Village which is dedicated to Japanese green tea that has won fans the world over. Learn more about its production at this tea factory and take home this fragrant tea as souvenir by your own expenses. Tonight, ascend the 333-metre high Mt Inasa Night View by ropeway and enjoy an aerial perspective of the spectacular night views of Nagasaki. After breakfast, visit Nagasaki Peace Park, which commemorates the atomic explosion on 9th August 1945 that contributed to the end of the Pacific War. Thereafter, take a drive to Shimabara. First stop: a jaunt to the city’s foremost attraction, Shimabara Castle which is reputed for an unusually striking castle reconstruction due to its regular, tall yet almost pyramidal design. For lunch, tuck into a Shimabara Guzouni lunch, a shimabara signature cuisine that comprise of rice cake soup topped with vegetables and bits of meat and fish. After lunch, proceed to Kuninotsu Port for a Wild Dolphin Watching Cruise experience. Subject to weather conditions, wild dolphin watching is available most of the time as locations of dolphin are tracked prior to cruise ride. Thereafter, proceed to Matsushima. This evening, wrap up the day with a relaxing hot spring bath. This morning, proceed to Kumamoto. Take a voyage back in time at 300-year-old Suizenji Park, which is a picturesque, meticulously landscaped garden offering a microcosm of Japan’s landscape, including a botanical representation of Mt Fuji. The park is most beautiful in spring and autumn. Next, take a leisure drive to Kagoshima. Endowed with a chain of active and dormant volcanoes, this prefecture is renowned for its hot springs. Catch a glimpse of the active volcano, Sakurajima Island, before you proceed to go on a shopping spree along Tenmonkan, the largest downtown shopping district in Kagoshima before rounding up the day in Ibusuki, a famous resort area located on the tip of the Satsuma peninsula. This evening, enjoy a delicious Kurobuta shabu shabu dinner that features premium, melt-in-the-mouth Kurobuta pork before donning a traditional yukata to experience a unique hot sand bath at an Ibusuki onsen resort, a suitably relaxing full-stop for a day well spent. After breakfast, stop by Kuma Shochu Museum. Like its volcanic landscape, Kyushu’s definitive distilled spirits, shochu, has a fiery character. Unlike sake, full-bodied and fragrant, shochu is light and crisp-best drunk on the rocks or with hot water. Taste Kuma Shochu and get to bag home some. Next, enjoy Seiwa Bunraku, a Japanese puppet play which is a form of traditional rural performing arts that represents Kumamoto prefecture. 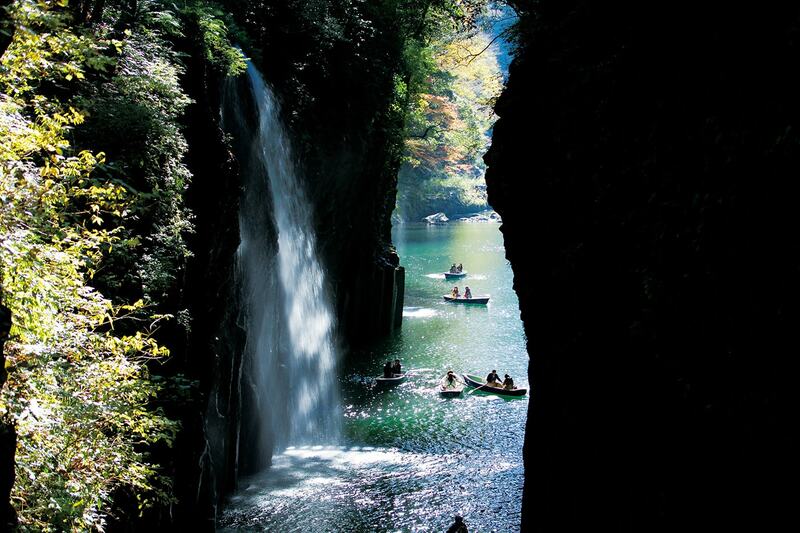 Thereafter, visit Takachiho Gorge, a narrow chasm cut through the rock by the Gokase River. The nearly sheer cliffs lining the gorge are made of slow forming volcanic basalt columns which resemble the scales of a dragon where the stone twisted and flowed as it formed. Partway along the gorge is the 17 meter high Minainotaki waterfall cascading down to the river below, and it is truly impressive to see the waterfall against a backdrop of dense green foliage and the surrounding grey cliffs. Stroll along the trails to admire to beautiful or hop on a boat and row your way down the river ride. Note: The visit to Takachiho Gorge requires a 30 mins walk from entrance on uneven stone road and steps. After breakfast, proceeding to take a morning walk on the Kokonoe “Yume” Grand Suspension Bridge to take in sights of the surrounds that offers a bird’s eye view of unspoiled nature’s splendour. Thereafter, proceed for a unique journey at Yufuin, to enjoy the picturesque rural beauty of Yufuin on a rickshaw ride on own expenses. Your journey will, quite literally, reach a boiling point as you make a jaunt to the renowned Beppu Jigoku Meguri. Visit Umi-jigoku, a pond of boiling blue water. Not quite Dante’s inferno, but one that will leave an impression nonetheless. This evening, pamper yourself with a traditional hot spring bath at an onsen resort in Beppu. On your journey back to Fukuoka, make a stop at Kitsuki Castle Town to visit rustic samurai houses. Next, enjoy a Kimono dress-up session. Thereafter, rev up and embark on a shopping spree at the shopping and entertainment hotspot Canal City Hakata, creatively designed with vivid colours galore. This complex is a miniaturized city within a city, with everything from a movie theatre and amusement park to restaurants and shops.